Strip brushes are designed to be used for chip removal, sealing, surface cleaning, conveyor cleaning, material transport applications and much more. Our strip brushes are manufactured from the finest carbon steel, tampico, nylon, polypropylene and natural filaments to ensure quality brushing action with each use. In addition to our standard strip brushes, we will work to meet your requirements for custom strip brushes. Find a distributor near you and order your brush strips strip brush today. 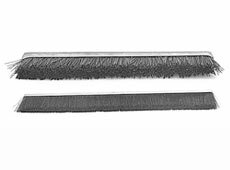 Overall Trim 1" 1 1/2" 2" 2 1/2" 3" 3 1/2" 5"
Custom strip brushes can be designed and fabricated to meet your specific requirements. The brushes can be made with carbon steel, stainless steel, brass, tampico, nylon, polypropylene or natural filaments. 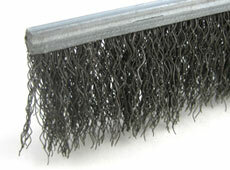 Strip brushes are ideal for brushing, chip removal, conveyors, machinery guards and air gap stops. Please specify channel number.